Portland’s mayor ordered police not to respond to calls for help from Immigration and Customs Enforcement (ICE) agents who were under siege by leftist protesters for more than a month, a report said. Protesters began surrounding the ICE building in Portland beginning June 17 after news reports on immigrant family separations. “The protesters briefly shut down the ICE building by blocking the entrances and exits, harassing employees as they arrived and attempted to leave,” Willamette Week reported on July 30. 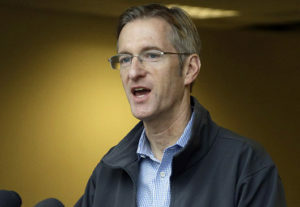 Portland Mayor Ted Wheeler ordered police not to intervene, even after ICE agents called 911 to ask for assistance, the report said. An ICE officer, who spoke to Willamette Week on the condition of anonymity, said two agency employees who were blocked by protesters from leaving the building called Portland police on June 19. One of those employees told Portland police that protesters followed his truck as he went to pick up his daughter from summer camp and harassed him in the parking lot. The ICE officer also said protesters showed up at his Portland apartment building a few hours later. Again, he called police, but says no officer responded. Chris Crane, president of ICE’s national union, said the situation at the ICE building in Portland spiraled out of control because police, on Wheeler’s order, would not assist federal agents. On July 30, members of the National ICE Council sent Wheeler a cease and desist letter demanding he require Portland police to assist federal agents if called upon. The union’s letter to Wheeler states that if the mayor does not allow Portland police to assist federal immigration agents, the ICE union will take him to court.